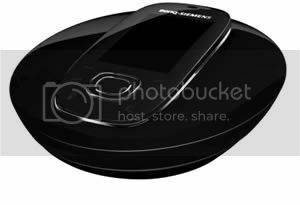 The BenQ-Siemens SL91 phone features a 3.2 megapixel camera with autofocus and a second VGA camera for video telephony. The phone also includes a 2 inch QVGA display capable of producing over 16 million colours. MicroSD card slot and an MP3 player with a stereo RDS FM radio are also provided. The SL91 from BenQ-Siemens also comes supplied with a stereo headset which doubles as a mobile hi-fi system and as a hands-free speakerphone for calls and video conferencing. The SL91 should be available in Europe from the fourth quarter of 2006 onwards, price to be determined locally.